The CTA Autónoma together with the CTA de los Trabajadores, the Frente Sindical para el Modelo Nacional and the 21F Movement, as well as with other social organizations and consumer associations have called for a demonstration in the city of Mar del Plata, in the province of Buenos Aires, this Thursday, January 24, against the latest utility rate hikes. 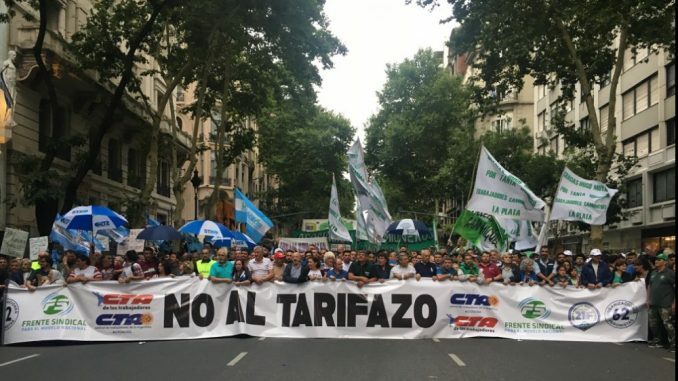 In dialogue with Radio De la Azotea, José Rigane, Deputy Secretary of the CTA Autónoma and General Secretary of the Luz y Fuerza de Mar del Plata trade union, said that “this policy, which has been implemented by the National Government since the beginning of 2016, has resulted in significant increases in the prices of transport, electricity, gas and water that hurt users’ pockets making it harder and harder for them to pay these bills. The Government seems unwilling to modify this political initiative which unloads the crisis onto the backs of the Argentine people. In view of this situation the main umbrella unions of the country along with other social organizations have decided to call every Thursday of January a mobilization against the rate hikes which will take place in different cities. The first one was held in Buenos Aires City on Thursday 10, this week is held in Rosario and on Thursday 24 a march will take place in Mar del Plata. Later the protests will be carried out in Santa Fe, Mendoza and other parts of the country. “From the CTA Autónoma we have proposed that there be a debt forgiveness for all Argentines who have become indebted to pay for public services. In many cases, families went to asked for loans to pay the price hikes. Our aim is to take to the streets and protest massively and peacefully so that prices of essential goods stop increasing”, Rigane explained.